Programmed Reality » Programmed Reality » Anomalies » TR-3B?! Guys, just thought I'd share an experience me and my brother had on 1st November 2018. We witnessed a fecking UAP (UFO)! We were outside in the back garden and decided to do a quick sky watch as it was very clear that evening. Time was about 17:00 (GMT). We were outside for approx. ten minutes and then we noticed an unusual craft in the southern part of the sky. It looked big and appeared to be triangular in shape. It also appeared to be tilted upward, and it was just sailing through the night sky! It also had a blinking red light at the apex and two white stationary lights at the base. The sighting lasted for a couple of minutes, then it just drifted out of view. I even managed to view it through my binoculars though, so it defo looked like a triangular craft and the lights defo appeared to be fixed together in a triangular shape. So what did we see that evening? Was it a TR-3B, or other secret craft? I've done two other sky watches recently but I've seen nothing else like that. And we are used to seeing police helicopters and airplanes in our night sky because we don't live that far from Teesside airport. You know, most of the objects we see in our night sky we can identify, but this thing on 1st November was nothing like we'd seen before. The triangular craft, hinting at the code, based on the number three, perhaps?! I'm okay with the model of the Universe as a Giant Quantum Computer and a conscious one at that. But what is the language/code that animates our reality? Self aware E8 or something similar, maybe? Klee Irwin and his associates over at Quantum Gravity Research are certainly looking into this. Also, I quote, John Preskill, Feynman Professor of Theoretical Physics, Caltech. Here he is talking about the inside of a Black Hole. Holographic quantum error-correcting codes are constructed by contracting perfect tensors according to a tiling of hyperbolic space by polygons. Interestingly, the code consists of pentagons and hexagons, but my understanding of his model is limited, so I cannot comment further. Again, hexagons, tetrahedrons, trigrams/hexagrams, triangles, cropping up all over the place.....and now in the sky! Is there something, magical about the numbers, three and six. I do often wonder about this! My goodness, Bot!!! You mentioned the number three. Did you see what time I posted this... I only realized last night that I posted this at exactly 3:33:33pm (I honestly had no idea I had posted it at this time)! It might read differently to people in other time zones, but when I loaded up the forum last night to see if anybody had replied I immediately noticed the 3:33:33pm. I instantly knew this was connected to our sighting, and that it is significant. Must be significant as the odds of me posting at 3:33:33pm is just too unlikely. And then like Bot said triangles have THREE sides! Profound numerology this. Well guys, I just feel now that things are starting to really get serious with me. You posted at exactly 15.33.33 (24 hour clock). What more can I say, but Wow!!! Also, did you not notice that the first two digits 1 and 5 add up to 6. LoL. Not only do the first two digits add up to six, but so do the 3rd and 4th digits (3+3=6) and the 5th and 6th digits (3+3=6), to give the infamous number 6:6:6 which is rather cryptically referred to as 'the number of the beast,' in Revelations Chapter 13 of the Bible. 666 is a triangular number. A triangular number is any one of the series 1, 3, 6, 10, 15,...... etc. and is obtained by continued summation of the natural numbers 1, 2, 3, 4, 5,......etc. 666 is the sum of the first 36 natural numbers. 36 also contains the digits, 3 and 6! 6 points, 6 triangles and 6 sides of a hexagon as can be seen in the image below. Its shape is that of a six-pointed star (hexagram) the compound of two equilateral triangles. 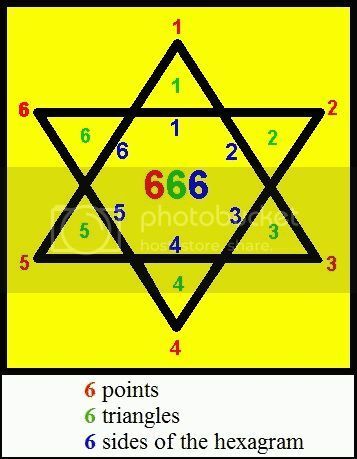 I got the above image from the web, but it should read the six sides of the hexagon, not hexagram. The six-pointed star is the actual hexagram. Perhaps, this "weird" "spookiness" we call "numerology" has to exists because "mathematics" is nothing if not "Representational." Meaning, it is a language to assign symbols to things allowing our subjective experience (i.e. "phenom") to appear as an objective experience (i.e. "ontic"). Quantum physics of today suggests that bundles of energy or electromagnetic waves, waves (vibrations) defined by numerical values (of their frequencies) are the heart of all existence. In other words, everything at its source has a vibration and number. Numerology might be that code breaker that exists because our very existence in the world is nothing more than "information." That information is always contained in a hidden number (a "hidden variable") like your birth date, for example. This "occurrence" whether it is your birth date or the time you saw a UFO, becomes a certain type of "knowledge." Today science knows that "Consciousness" has a strange connection to "Reality." An individual might become closer to his or her own higher divinity simply by manipulating the numbers that represent (can be assigned to symbolize) the meaningful occurrences we have in each other's reality. Thus numbers bring a sense of perspective to the joys and sorrows of this world and must be even more pronounced when we share an experience with another human. I love it when two people see an unexplainable phenomenon (like a UFO) at the same time. It really confirms that we are not just imagining things. This digital information theory of reality does not mean there is "NO" reality. It simply means that the "grand" miracle of life is itself a simulation (or creation). Whenever we "create" a symbol to define an occurrence in our lives, we are making our own "simulation" within the "simulation" that is our existence. Thanks for your feedback, jdlaw. Traditionally it has been assumed that language is a conduit for thought, a system for converting our pre-existing ideas into a transmissible form, for example, in written symbols, sounds, gestures, etc.. But, what if language is not merely an interface but also plays a formative role in shaping thought itself? At its strongest, this view is that "language" becomes thought or isomorphic to it, for example, language = digital physics = new thought = reality = simulation. Remember in the movie 'Arrival,' thinking in a different language -non-linear orthography- caused Dr Louse Banks thought patterns to change. This is the core idea at the heart of the movie. Taking all of this into account, I do often wonder what our view of reality will be like, say, 500 years from now, and chances it might not, even be, 'digital information theory'! However, I'm quite content that we live in a Quantum Computational Universe, for now. So lets talk qubits! If conscious qubits spontaneously erupt from the Void then I also believe that there is some code that animates them, something else is coming out of the Void. Lie Algebra? Quantum Tensor Networks? - but the code may also defy human analysis. If not, how do you explain the 'Standard Model of Particle Physics'? I'm not an expert on this subject and I believe it is incomplete, but there seems to be a definite pattern to it. Why exactly 64 codons in the genetic code, for example? (64 equals the number of I-Ching Hexagrams, by the way). How do you explain all of this, if "mathematics" is nothing if not "Representational," as you mention? (I am in my heart, probably, a card-carrying Platonist!). Personally, I think the 'system' is not collapsing those qubits in any old random fashion. Consciousness seems to form a definite pattern of sorts. But, heh, what do I know! Great feedback from JDLAW and Bot there. Thanks guys, you both are so awesome. I'll certainly keep you guys updated, and if I see another UAP in the sky you two will be the first to know about it. Thanks for your kind words Ekuma. Happy UAP-gazing!